Flytippers have sparked fury in the Coalisland area after dumping takeaway food waste along a roadside. At least four bin-bags of frying chips were hurled into the hedgerows of Derrylaughan Road over the weekend. Residents have expressed their disgust at the fast food waste which has been rotting and attracting vermin. Washingbay Community Group say that flytipping is a problem in the area and have asked anyone with information to pass it onto any group member. There are fears that the incident may be linked to the fact that rubbish skips are temporarily unavailable at Coalisland Amenity Centre due to works at the facility. 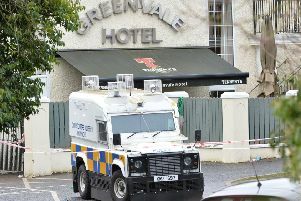 Sinn Fein Councillor Joe O’Neill also expressed his anger at the incident. “This is deplorable behaviour which should be condemned”, he said. “I warned the council that illegal dumping might increase as the amenity centre in Coalisland has been closed due to an upgrade. “I asked that temporary skips be made available, however, I was informed that this would contravene health and safety regulations. “I am already concerned about other flytipping sites at Kettle Lane and Dernagh Lane, and an increase in illegal dumping across the district. Using social media, the local community group have urged residents to be vigilant and take note any such illegal activity. Ideally they would like whoever dumped the bags to remove them and dispose of them properly. The amount of household rubbish, industrial and fuel laundering waste dumped at the side of Dungannon District roads and beauty-spots has increased dramatically in the past year, making it the second worst flytipping hotspot in Northern Ireland. More than one illegal dump is discovered every week, according to the latest figures from the Department of Environment, with the number doubling from 27 to 54. Compared to Dungannon’s grim tally of 54 flytipping incidents, there were just 18 fly-tipping incidents in Cookstown and 12 in Magherafelt. Newry and Mourne had the highest number at 97, while Moyle had the lowest at 7.